This past Tuesday I shared with you Crispin’s volume one of new eBook series in regards to the Families of China, Nuevo Leon, Mexico. 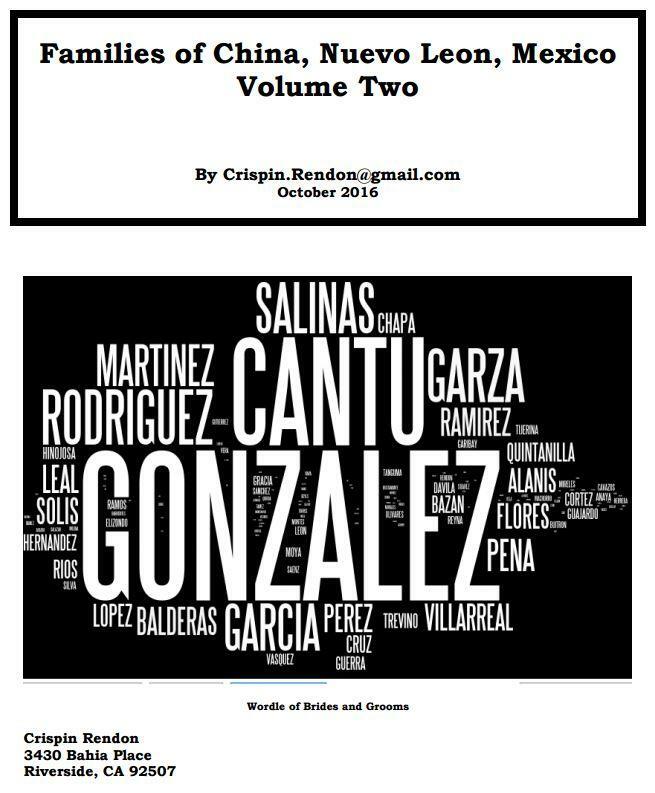 Today it is with great excitement that I share with you his latest eBook in this series, it is “Families of China, Nuevo Leon, Mexico Volume Two”. Crispin has made this ebook free and I highly recommend that you get your own copy for your digital library before it is gone. These ebooks are an essential resource to anyone researching Nuevo Leon, especially the families of China Nuevo Leon. Volume two of four in this series of Families of China, Nuevo Leon contains marriage information from 500 marriage records found on the FamilySearch.org browse online collection (matrimonios 1795-1919). These marriages occurred in the time span of November 23, 1833, to September 20, 1856. These marriages are found on images 120-239. Basic information from the marriage records is presented along with other information gathered in an attempt to present two generation descendant reports. Most of the non-marriage record information presented was gathered using the FamilySearch.org database index. Like always don’t forget, download your own copy of Families of China, Nuevo Leon, Mexico Volume Two since bandwidth is limited and if it already ran out you will need to wait till next month to get your own copy. Let me know of any great discoveries that you may find within this gem of a book. For some reason I the link for China N.L does not work. Is there any way you could send me the links? Unfortunately these eBooks are only available for a brief period. Once Crispin re-shares them i’ll let you know. I CAN DOWNLOAD THE PDF FOR VOLUME 4 BUT NOT FOR THE OTHER THREE. CAN WE AT LEAST DOWNLOAD THE PDF FORMS OF THE MANUSCRIPTS? What PDF forms? If they are not available it is because Crispin already took them down.